Lumpy then (left) and Lumpy now (right). 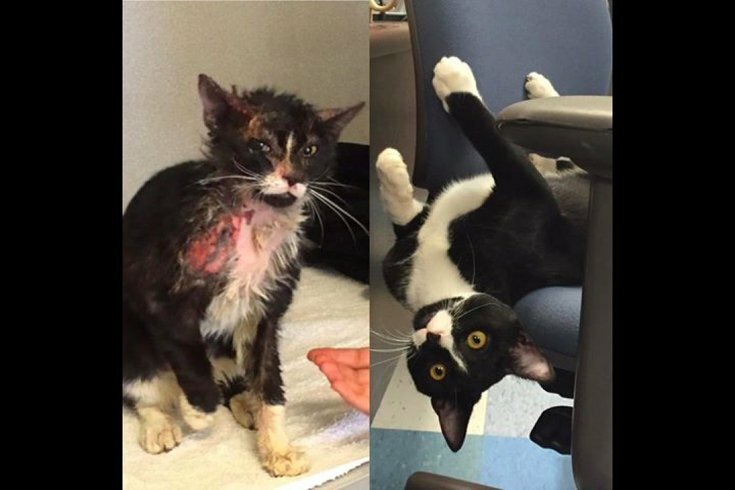 A South Philadelphia woman was found guilty of animal cruelty after dumping her injured cat at a shelter, the Pennsylvania Society for the Prevention of Cruelty to Animals (PSPCA) announced Friday. The cat, now known as Lumpy, was discovered outside the Philadelphia Animal Welfare Society (PAWS) clinic in Grays Ferry. PAWS staff said the cat was "covered in a thick, sticky, gooey substance and suffering from chemical burns, dehydration and emaciation." However, the cat made a "miraculous recovery" and is now available for adoption. Philly.com reports that Shivone Williams, 28, of the 1500 block of South Etting Street, was fined $500 and is prohibited from owning animals for 90 days after sentencing on Thursday. In June, Williams told the clinic that the cat escaped her house and she did not want it back when contacted by the clinic. The PSPCA said that Lumpy is a staff favorite. Anyone wishing to adopt Lumpy should contact PAWS.